It’s that time of the year again, get a paper and pencil, set your New Year’s resolutions and promise yourself you will become a better person. 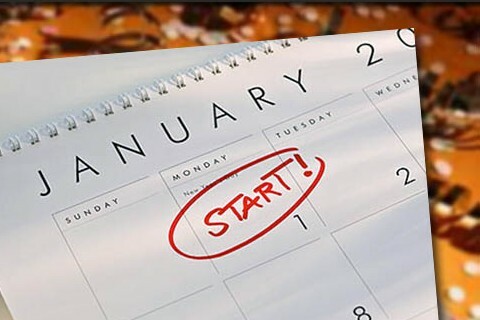 According to Wikipedia and About.com, the most popular New Year’s Resolutions are related with weight loss, exercise, quitting smoking and drinking, healthy eating, spending more quality time with friends and family and settling debts and other financial issues. Some people consider New Year’s resolutions a waste of time but shouldn’t be this way. Setting personal challenges is a great way to convince yourself that you want to achieve more and most importantly you are willing to do it. Even if you succeed in one of them, at the end of the year you will feel proud and more confident. According to studies only a 12% of those who make New Year’s resolutions manage to achieve them. The others do it simply out of custom or because it makes them feel good. If you want to be in the 12%, follow our tips below for setting realistic and achievable resolutions. Instead of saying “I will not stay up all night to work” better write “I will go out more often during the week”. Instead of writing “I will not eat junk food” better write “I will eat healthier”. These may look exactly the same, but the positive expression helps produce positive results. If for example you’re resolution is to make more money the next year, the correct resolution is not “I will make more money” but the ways in which you can achieve this. Will you work more? Are you willing to claim the overtime they own you from last year? Will you take a part-time job as well? Think of all possible methods to achieve your goals and select the most effective-or easier, depending on your goal and note them down. It makes no sense to set unrealistic resolutions. You are just wasting your time and at the end of the year you will be disappointed. For example, if your goal is weight loss, don’t expect to lose five pounds in five days. It is practically impossible, and even if successful, you would end up with crushed nerves and you will gain the weight back (and more) very quickly. If on the other hand you set a goal to lose 1 pound per month (which is very realistic) and the end of the year you will weigh 12 pounds less. The New Year’s resolutions are not social requests, and should not commit on what others expect from you, but what you want for yourself. If you are an avowed enemy of the gym, there’s no reason to write that you will join a gym just because your friends are doing it. Offset the need for exercise by going twice a week for dancing (or do any other activity that you like) and trying to eat healthier. Similarly, if you want to meet new people but you are not what they say ‘party animal’, do not promise yourself that you will suddenly start going out in bars or clubs. You can register for a seminar, start a foreign language or hang out with colleagues. There are always alternatives you need to think well to find them. Balance the list of “obligations” with the things you really want to do. Do not get stressed to keep your list. Once you’ve decided what you want to achieve in the New Year, you’re resolutions are always in the back of your mind. There is no need to check every week if any of your goals have been met. Relax, de-stress and believe in your abilities. If you have the necessary willpower and patience and if you have set realistic goals, some of them will be achieved. This is a great post, especially for this time of year. Resolutions are the way some people try to get back to their best self. It’s not too hard I don’t think to maintain these things. I have been reading A Rebel Chick Mystic’s Guide by Lisa Selow (lisaselow.com if anyone wants to check out the book) and it has really given me a great start and approach to get back to who I want to be, and do it my way! Like you said in the post, these resolutions are “for you”. That’s absolutely right! That’s something we all need to remember when making our list of resolutions this year!